Rather, this post should’ve been entitled “Latest Build: They weren’t kidding when they said working bare aluminum is hard”. More on this later. 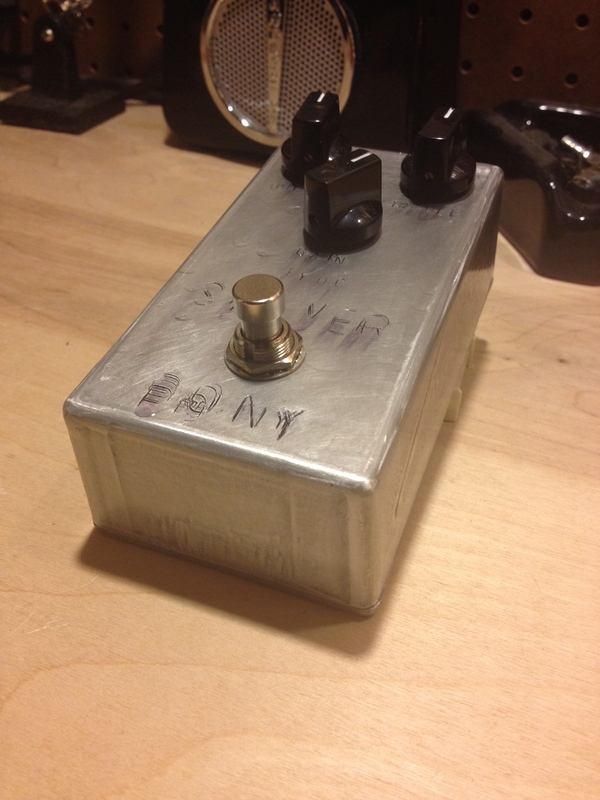 My latest build, another guitar pedal from Build Your Own Clone is the Silver Pony, which is a clone of the revered Klon Centaur. The Klon Centaur, which apparently has not been in production in some time, is perhaps one of the most coveted pedals ever, also one of the most hotly debated. People are passionate about this critter, to the point of engaging in virtual fisticuffs. I’ve never played one, but I have heard them quite a bit, and since this kit is now in a limited run, I wanted to get my hands on one to try it out and see what all this hullabaloo is all about. I’ve always been a Tube Screamer kind of guy. I’ve used a TS-9, a TS-10, a modded TS-5, and a stock Voodoolabs Sparkledrive – I like the fine grain of the silicone clipping diodes, and have never really been too bothered by the loss of bass. I usually tend to roll off more bass and add more treble to my tone anyway, especially when I’m playing the Gretsch 6119 with the Filtertrons, and I don’t really use too much overdrive, just enough to put some hair on my signal. Once I got bit by the DIY bug and after doing some mods to my Voodoolabs Sparkledrive and building the BYOC Overdrive 2, I do love the modded tone. Very versatile for playing low drive stuff, and love the selective EQ circuit for the “fat” bass mod. See my post on the Overdrive 2 for more details. The Silver Pony is a different kind of beast than the Tube Screamer to be sure. It’s got more of a “tube” kind of sound than the Tube Screamer, which has a fine grain clipping tone, and a bit of a midrange hump. The Silver Pony, with it’s germanium diodes for the clipping section, provides more of a “spittier” kind of tone, a very smooth, tube kind of overdrive, combined with a pair of TL072 opamps. The Treble control cuts or boosts treble, good bass response, and the GAIN knob controls the amount of drive. I noticed during the build that this pedal has a dual-ganged knob, probably to mix the drive and clean signal. This kit also has a very nice trick to it, that with the gain turned all the way down and the output turned up, it’s a fantastic clean boost. Another noteworthy feature is the absence of true bypass, the buffer in this pedal is actually quite nice. The circuit board is a joy to work on. Nice, clear silkscreen, the pads are all through-hole, and durable coating, which held up without damage both times I “skated” the iron across the board. The build doesn’t have a large parts count, but for some reason (perhaps I imagined it), this pedal’s circuit board has some pretty tight spacing between the components. I had to scrape a couple solder bridges, and re-mount some resistors that were not flush with the board. My least favorite was doing all the off-board wiring, but after the third time building one of these kits, I kind of have gotten used to it.